I was born in a land of myths and wonders, as told in A Thousand and One Arabian Nights – home to the Tower of Babel, the Hanging Gardens of Babylon and the Garden of Eden. When Mesopotamia became Iraq I saw my country emerge from a primitive past into what promised to be a brilliant future. My birthplace, Baghdad, was beautiful, civilised, and full of cherished memories. Now it has been replaced altogether, erased like chalk on a blackboard, and a new story is being written. I feel as if I am telling you a dream and it will be very hard for you to join the pieces together. The scenes that imprinted themselves on Violette's young mind stemmed from early childhood days when the family lived in the central Hennouni district of Baghdad — a vibrant and almost biblical backdrop that characterised the dying years of Turkish rule. By the time the new nation was born they had moved well to the south of the city, away from the risk of cholera that threatened the population whenever the river was in flood. 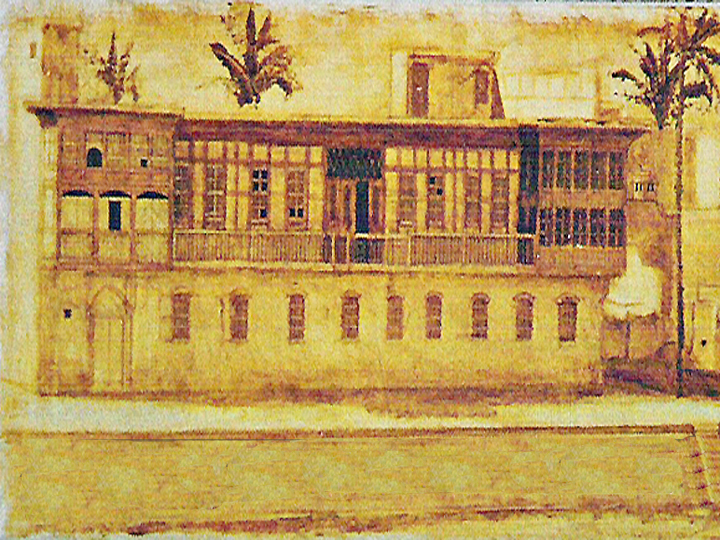 'Home' was now a qasr, or ‘palace’, on the banks of the Tigris, built by her father, Menashe Ishayek, a respected merchant, banker and savant. There she grew up, alongside her five sisters and brother. Living in the Karrada district, in open countryside, felt like being in the Garden of Eden, for it really was the garden of Baghdad with its date palms and orchards. After the crowded conditions of Hennouni the change was dramatic, for now she was surrounded by palm groves and fruit trees, fresh air and scents of roses, orange-blossom, jasmine and gardenias. 'Instead of having to press past people in cramped alleyways it suddenly seemed as if we were flying on a magic carpet alongside the bulbul songbirds that nested there and filled the air with musical notes of incredible beauty,' Violette wrote. They were Arcadian conditions in which to grow up, a cultured and educated young lady witnessing Mesopotamia’s development into the country that became Iraq. She learned to honour the traditions of her faith while absorbing the history of her people, attending the Alliance Française school, and later as a young woman enjoying shopping at the city’s very first department store and experimenting with western fashions… a daring concept at the time. Beit al Yehud (House of the Jews) by artist Lora Selim. The banks of the Tigris were once lined with such wood and stone structures. 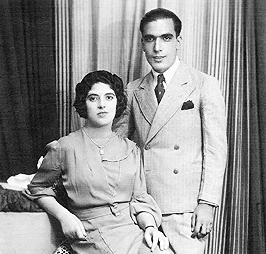 Baghdad was only slowly adapting to the modern world, so when she and her younger sister Daisy went to Palestine to see their elder sister Fahima, who had settled in Tel Aviv, the experience was liberating. They stayed there from 1933 to 1934 and felt very emancipated. It was the first time they had come across a liberal way of life. Being able to swim in the sea provided a special memory, for such reckless behaviour was unheard of back home. 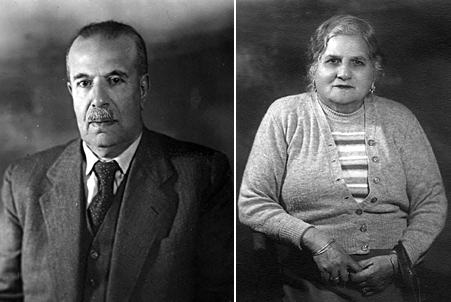 In 1937 she was introduced to Dahoud (David) Shamash, and they married. A daughter, Lena, was born in 1938, followed by another girl, Mira, in 1941. It was the month of May in World War Two, a time of blackouts and curfews in Baghdad due to hostilities which had erupted between Britain and the country's pro-Nazi junta leader, Rashid Ali. Two weeks later, on the Jewish holy festival of Shavuot (Pentecost), came the pogrom known as Farhud. Violette recalls the entire family sheltering in the basement in the dark, listening all night long to the distressing screams of women shouting and calling the names of their loved-ones being murdered. Miraculously, they escaped, thanks to the kindness of a Muslim neighbour. But for Violette and David it was the beginning of the end. With three-year-old Lena, and six-month old Mira, they fled, moving first to India, then Palestine (where a son, Simon, was born in 1945) and then Cyprus, the new State of Israel, and finally to London in 1964. ‘I saw my country emerge from a primitive past into what promised to be a brilliant future. It was my Baghdad, my native land where I grew up, happy and privileged, in a Jewish community living harmoniously with our Muslim neighbours. My Baghdad was beautiful, civilised, full of cherished memories. Now it has been replaced altogether, erased like chalk on a blackboard, and a new story is being written. While preparing her memoirs Violette stayed in daily phone contact with her surviving sisters in America and Israel, Na’ima, Fahima and Daisy, often to check a fact or to ask them to fill in some gap in her memory. This way, Memories of Eden was a truly collaborative effort. Finally, on 21 March 2006, in her 94th year, in failing health but supported by loving children, grandchildren and great-grandchildren to whom she dedicated her book, Violette passed away.